Sometimes, dinner just happens. You look at the random mixture of ingredients sitting on your countertop and go for it. I realize that many people don’t understand this and can’t imagine either A) not using a recipe or B) actually making dinner instead of picking up takeout. If you fall into either category, you’re in luck. All three of the things I made for dinner the other night are easy (no, ACTUALLY easy) and only involve a few ingredients each. Give yourself an hour or so and get ready to impress your guests. I still didn’t manage to get around to it! Then a visit from my dad and stepmom last week left me with a new Cook’s Illustrated cookbook, Perfect Vegetables. The book features information and recipes including each of more than 50 favorite vegetables — as chosen by the magazine’s editors. First up: artichokes. The time had come. I had a bunch of random ingredients at home, including a spaghetti squash, peppers, onions, tomatoes and a few other random things. I had about 90 minutes until I said dinner was served, so I bolted to the store for artichokes, basil and a baguette and quickly got home and to work. Here’s how it all went down. I don’t know what to look for when it comes to artichokes. They were a lot more round than I feel like I usually see, but I grabbed two and figured it would all work out. It did! And considering tarragon is basically the only herb that survived my neglect this summer, I had to use the following dipping sauce of the three offered in the book. This can be made ahead but Cook’s recommends adding the fresh herbs just before serving. 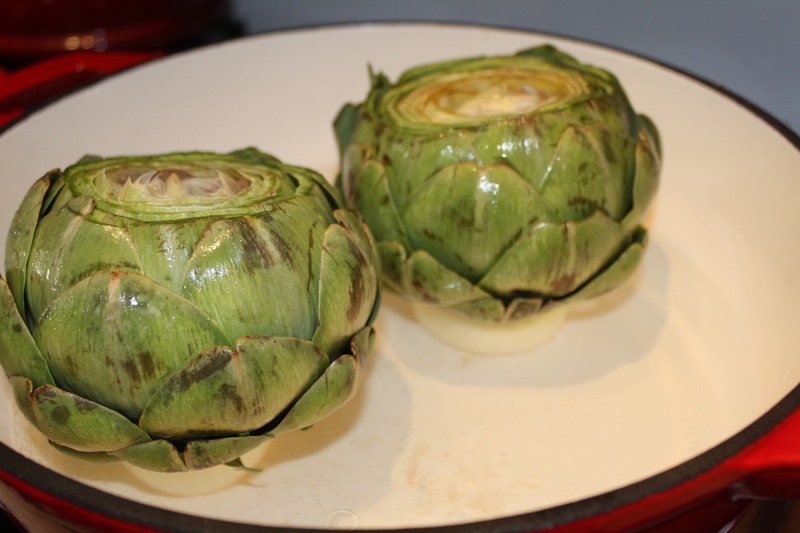 You will need 1-2 onions, 1 lemon, several cups of water and artichokes. 1. Fill a bowl with cold water. Cut a lemon in half and squeeze water in to the bowl, then drop lemon halves into it. 2. 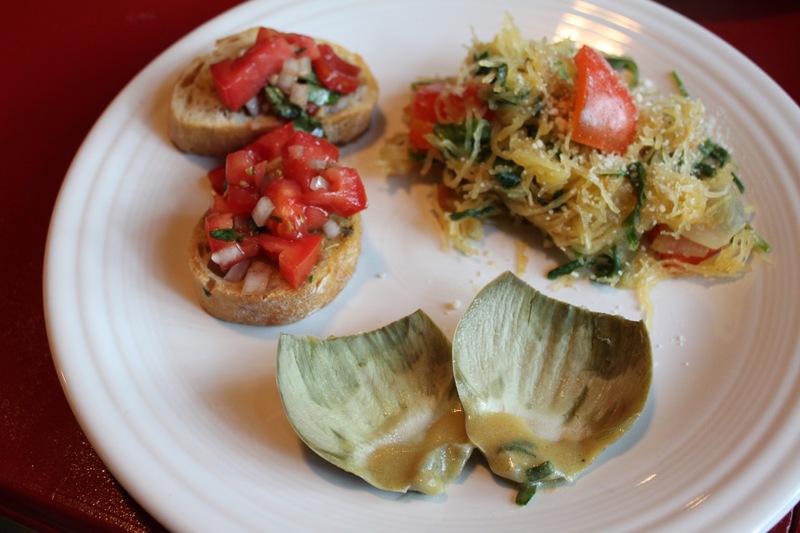 If artichokes have pin-like thorns on the ends of the leaves, grasp artichoke by the stem and cut tips of leaves with kitchen scissors. (I didn’t have to do this). Rest artichoke on cutting board and, holding the stem to steady it, cut off the top two layers of the leaves with a sharp chef’s knife. You can now cut the stem off to make for a flat bottom — and drop them in the lemon water. 4. Place onions in bottom of large pot or dutch oven and fill with water (I used the lemon water) up to 1/2-inch below top of onion slices. Set artichokes on top of onions. Bring water to boil over medium-high heat. Cover and cook until the outer leaves release easily when pulled. About 30 minutes. Check the pot periodically to make sure the water hasn’t boiled dry — add as needed. 5. Remove artichokes with tongs and let cool 15 minutes before serving, or chill and serve cold (I did this with the leftovers — equally delicious). Remove each leaf, dip in vinaigrette, then scrape the bottom “meaty” part off with your teeth (basically the part covered in vinaigrette in the very top photo), discarding the bulk of the leaf. When you’ve removed all of the leaves, discard the hairy “choke” and eat the heart (with a fork and knife if you’re civilized. With your hands if you’re me). Delicious! So easy and looks totally fancy and impressive (if you ask a simple gal such as myself). If you’re my next dinner guest, get ready — we’re having artichokes. The vinaigrette was really good — I think it would be great on any vegetable or salad. 1. Preheat oven to 350 degrees. Slice squash in half, remove seeds/pulp from center and place face down on baking sheet (I lined mine with foil). Bake at 350 degrees for about 45 minutes. When you can pierce skin easily with fork, it’s done. Take out and let cool for several minutes before handling. 2. As it’s cooling, saute chopped peppers, onions, tomato and any other veggies you might like in a little olive oil. I also added salt, pepper, and some Italian seasoning (or whatever seasoning you may prefer). When these were cooked to my liking, I grabbed the squash and scraped the inside with a fork — the spaghetti like flesh easily comes up and I put it directly into the pan. After that was heated through, I added fresh baby spinach and torn basil leaves and cooked until both were wilted. That’s it! 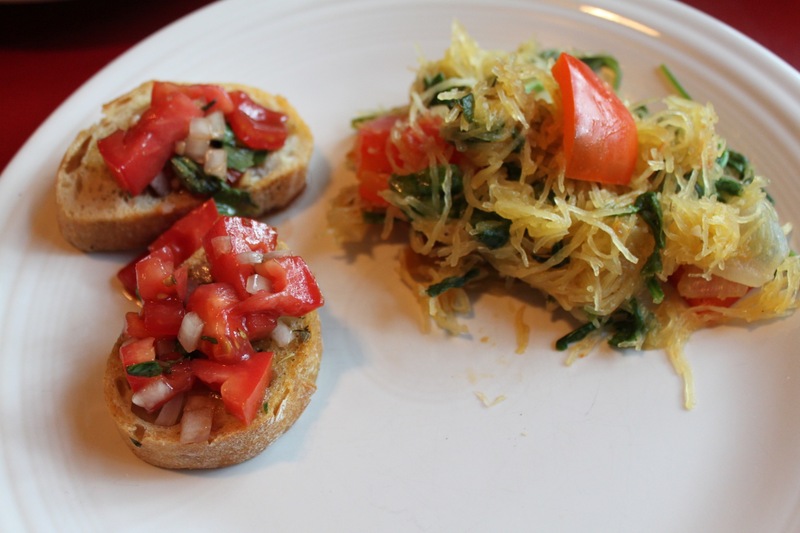 You can also top with parmesan cheese or your favorite parm substitute. • tomatoes (depends on how many will be eating it. In this case, I did 3 roma tomatoes and it was plenty), diced into small pieces. 1. Mix all of the above, until you have a ratio that looks good. I just kind of wing it — if you like onion, add lots. If not, scale it back. I sometimes add cucumber to the mix, diced about the same size as the tomato, if I want to change it up. 2. Mix together some olive oil and whatever spices you think would taste good. I did salt, pepper, garlic powder and Italian seasoning. I then brushed it on both sides of sliced baguette and baked on a cookie sheet (I removed the foil from the squash and used that one) for about 10-15 minutes. Flip about half way through if you remember (which I never do). Spoon tomato mixture on each slice of bread and you’re done. I think the possibilities are endless when it comes to what each of these dishes would go well with. 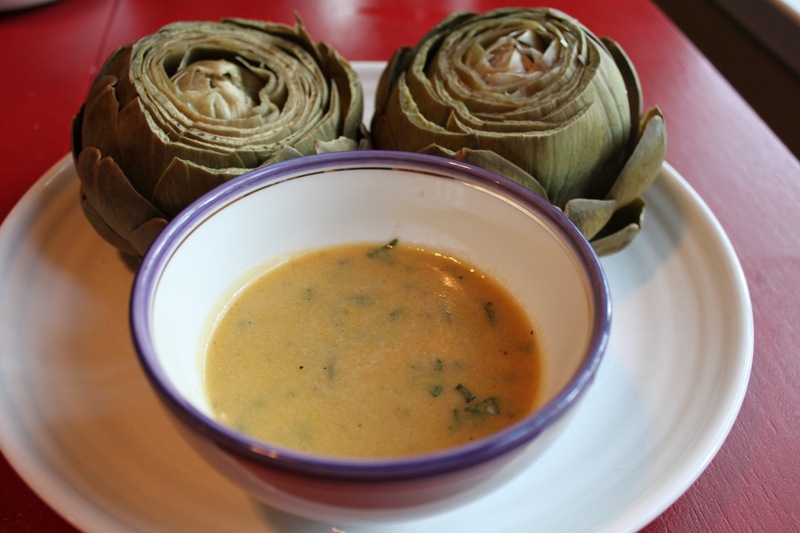 I especially look forward to coming up with some of my own dipping sauces for the artichokes next time. We both left feeling plenty full, but it is such a light and delicious meal. I’m sure I’ll do this combo again. Entry filed under: Appetizers & Dips, Dressings and Sauces, Main Dish, Recipes, Side Dishes, Uncategorized.